A look at the way e-mail, text messaging, and observations of daily living are changing the way health information is exchanged. The way we communicate is rapidly evolving, and it’s no different in the healthcare world. Though it may be a little behind other industries, which have been using new forms of communication for awhile, healthcare is beginning to embrace new communication patterns. Three in particular—e-mail, text messaging, and observations of daily living (ODLs)—have risen to the forefront to give caregivers and consumers a variety of new options when it comes to exchanging information. What has held some physicians back from going this route has been their concern with meeting HIPAA requirements for security and privacy and, more recently, the increased emphasis on enforcement as a result of the American Recovery and Reinvestment and HITECH acts. However, software solutions could help eliminate this issue. Marcy Zwelling, MD, who is in private practice in Los Alamitos, Calif., is a believer in e-mail’s productivity. “Why should a patient have to get in their car and drive to an office and sit in a waiting room for two hours to ask a few questions that could’ve been asked through e-mail?” she asks. “If a patient tells me they feel awful and have a fever, it doesn’t make sense to make them get out of bed. Instead, we discuss their symptoms and I tell them what to do through e-mail. Then I follow up the next morning.” Zwelling also sends e-mail blasts and newsletters to her patients to maintain more regular communication. In the past, many physician offices have used faxing to disseminate information to patients and other offices, but new HIPAA laws may make that option obsolete. 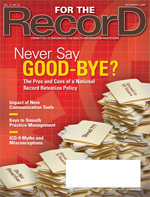 “We recently received a memo from our attorney stating that any communication that is not fully encryption secure will no longer be acceptable, which includes faxing, a primary means of sharing data,” says Beth Crowder, executive director of United Physicians, a physician organization in Charleston, S.C., that facilitates participation in healthcare plans and provides services promoting quality and efficiency in the practice and business of healthcare. Crowder adds that it’s important for the transition to e-mail communication to be as easy and unobtrusive as possible. “E-mail is a system with which everyone is familiar, and for physicians, who are already extremely busy, this is critical for ease of adoption. It removes the ‘hassle factor,’ which out of necessity comes with many new technologies,” she says. The CDC has several text messaging programs, including an H1N1-related project, and pilots in the works that allow users to sign up to receive information briefs. (The public can join the program by texting HEALTH to 87000.) The CDC will take a look at the data received from these programs to determine their effectiveness, as well as important demographic information on the users, which will help make decisions as it addresses future messaging possibilities. Though quite different than technology-based forms of communication such as e-mail and text messaging, ODLs are also an important new data collection method. This patient-centered practice gathers information on activities and experiences such as diet, exercise, sleep patterns, and adherence to medication regimens in addition to standard data recordings. People with diabetes, for instance, may record their own blood glucose levels but, in addition to noting the levels and the times they were taken, they would also note other data such as what they’d eaten that day or perhaps even the amount of exercise they endured—additional experiences that likely affected the readings that were obtained. The adoption of ODLs for data gathering is changing what kind of information is considered pertinent for a health record—and, more importantly, who is gathering that information. It’s also another step toward the development of reliable and accurate PHRs, making them a more trusted source of patient data.